Election material of the ruling MPLA party and its candidate João Lourenço, used with permission (Jiku ). Angola is currently in the middle of campaigning for the upcoming elections on August 23, 2017. This will be the first time since independence that the current president, José Eduardo dos Santos , will not be a candidate. The electoral list was approved by the central committee of the ruling party, Movimento Popular pela Libertação de Angola (MPLA) , on February 4 and is led by the former defence minister, General João Lourenço, who will become the country’s president if MPLA wins the elections. 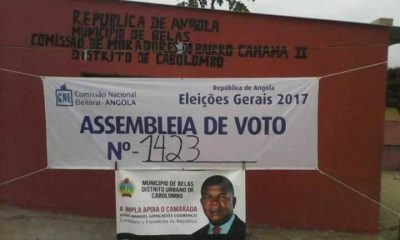 Among the opposition, two well-known parties are competing — the União Nacional para a Independência Total de Angola (UNITA) and the alliance Convergência Ampla de Salvação de Angola (CASA-CE). In terms of voters, 9.4 million Angolans will be called to the ballot box. A verdade é que as autoridades angolanas não quiseram dar condições para essa missão ir a Angola, porque caso contrário tinham feito o convite há muito tempo. Portanto, se o Governo angolano escolheu apresentar o convite tão tardiamente, inclusivamente depois de uma missão de peritos eleitorais que a UE enviou para Angola e nem sequer no convite reuniu as condições básicas, que sabe perfeitamente que são exigidas pela UE porque são padrões para qualquer país onde a UE vá observar, então a minha conclusão é que, de fato, não havia vontade política nenhuma das autoridades angolanas convidarem a UE para observar as eleições. The truth is that the Angolan authorities did not want to provide the conditions for this mission to go to Angola, because otherwise they would have sent the invitation long ago. So, if the Angolan government chose to send the invitation so late, including after a mission of electoral experts that the EU sent to Angola and not even the invitation met the basic conditions, which it knows perfectly well that they are required by the EU because they are the standards for any country where the EU goes to monitor, then my conclusion is that, in fact, there was no political will of the Angolan authorities to invite the EU to observe the elections. Among civil society organizations, the association Handeka  has put forward the project Jiku , an initiative which envisages that citizens, beyond simply voting, assume the role of election monitors on election day. Jiku aims to gather information on one platform — www.jikuangola.org — giving people a place to redirect all their complaints and demands. The website explains that “Jiku” is a Kikongo word meaning “a sitting for a wise discussion of problems, normally around the campfire”, and is simultaneously the first part of the word “Jikulumessu”, meaning “open the eye”. Jiku involves several well-known Angolan figures, such as the ex-prime minister Marcolino Moco, and Luaty Beirão and Mbanza Hamza of the 15+2  group of human rights activists, who were controversially detained for months on security charges, before later being released. Incentivar as pessoas a não se comportarem como eleitores numa democracia comum onde as pessoas vão, votam, escolhem o seu candidato e voltam para casa. Porque todos nós nos queixamos de vícios e irregularidades eleitorais, então é preciso que todos se comportem como monitores eleitorais e que estejam atentos. Encourage people to not behave like voters in an ordinary democracy where the people go, vote, choose their candidate and go back home. Because all of us complain of malpractice and electoral irregularities, so it is necessary that everybody acts as election monitors and remains alert. Depois de exatamente 1 hora de direto da TV Zimbo  às atividades que ocorreram em simultâneo esta manhã no Huambo (‘Candidato’ João Lourenço ) e Luanda (Higino Carneiro no Kilamba Kiaxi), eis que somos brindados com uma ‘autoridade tradicional’ que, encorajada pelo jornalista e citando atabalhoadamente uma passagem bíblica, confessa ter abençoado João Lourenço e que mais ninguém pode ser abençoado. After exactly 1 hour of live transmission of TV Zimbo  of the activities which took place this morning simultaneously in Huambo (‘Candidate’ João Lourenço ) and Luanda (Higino Carneiro in Kilamba Kiaxi), here we are treated to a ‘traditional authority’ that, encouraged by the journalist and haphazardly quoting a biblical passage, confessed to having blessed João Lourenço and that nobody else could be blessed. This initiative resembles the project Txeka , created by young activists in Mozambique during the 2014 elections, whose mission was to observe and monitor every moment of the elections.